Renault says the DeZir concept shows the brand's commitment to more emotional styling. 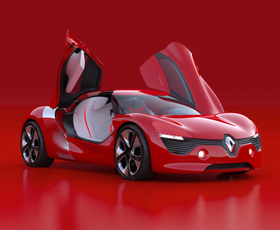 Renault is breaking away from the angular styling favored by its former design chief, Patrick Le Quement. The French company will show a concept car that highlight's the brand's more emotional design at the Paris auto show in October. Called DeZir, the two-seat concept, which is powered by an electric motor, is the first project led Laurens van den Acker, who succeeded Le Quement last October. “DeZir stands out as an illustration of the brand's commitment to more emotional styling,” Renault said in a statement, adding that the concept marks the start of a sequence of cars that will provide an insight into the company's new design direction. At 4225mm, the The DeZir is 70mm longer than the Megane coupe. Renault did not say if the concept previews a production car. The 'Z' in the name DeZir is a reference to Renault's Z.E. (zero emission) strategy. Renault is launching four electric cars within the next two years as it aims to become the first full-line manufacturer to make zero-emission vehicles accessible to the mass market. To underline its sporty character, the DeZir is a rear-drive coupe powered by an electric motor mounted in a mid-rear position to optimize weight distribution. The vertically mounted 24 kilowatt hour lithium-ion battery is located behind the bench seat and provides the car with a range of 160km and a top speed of 180kph. The motor is the same as the unit that will be used for Renault's production electric cars, although its power and torque to be uprated to 150hp and 226 newton meters respectively. Renault says its new design vision is based on three keywords – simple, sensuous and warm – and will be founded on the notion of the "life cycle." “This vision also builds on the bonds that are gradually forged between the brand and its customers at watershed moments of their lives, such as when they fall in love, start to explore the world, found a family, begin to work, take time to play and attain wisdom,” the statement said. Under van den Acker, Renault's design department has revised its methodology, and a single team of designers will now be responsible for each new concept car and for the ensuing production model it previews. Before joining Renault, the 44-year-old Dutch designer was general manager of design at Mazda Motor Corp. in Hiroshima, Japan. Before that, he was chief designer of strategic design at Ford Motor Co.